I fell in love with this hat from Krista of Rescued Paw Designs the moment I saw it. There is just so much to love here! First, it’s three colors. Over the last 20 years of my crochet design career, I’ve done my share of three color designs and you guys just *love* them! Second, it’s EASY! I mean, seriously. This hat is fabulously fun and easy. You’re just making a rectangle with no shaping at all. Third, it looks fantastic, trendy and much more difficult than it actually turns out to be. It’s one of those crazy easy projects that looks wonderful; the kind of project that we all love the best. Time to hit that yarn stash for your three favorite colors! 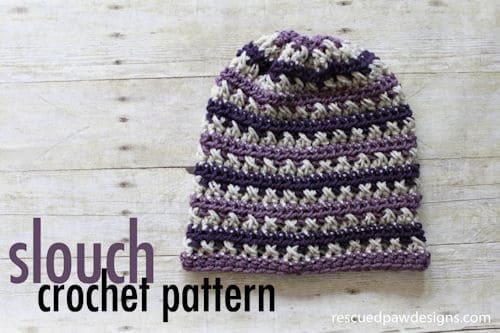 Pick up your free crochet pattern from Rescued Paw Designs HERE.